It is no secret that I love cats. I am a proud "cat mom" to 4 little balls of fur! As most of us cat owners know, one of the most challenging aspects of owning a cat is dealing with pet odors. I am very strict about keeping my litter boxes clean and tidy. 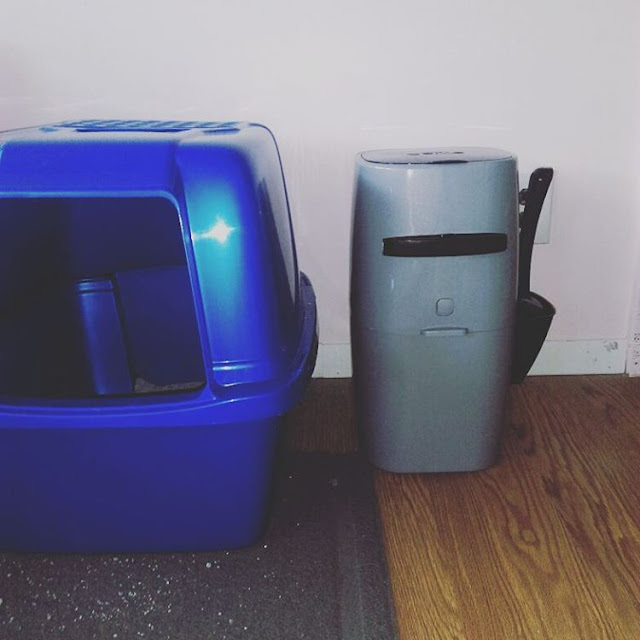 But having 4 cats means that I have 2 litter boxes in my home that I need to care for. Although keeping my litter boxes tidy is no problem, its the trash situation that can sometimes be the cause of my pet odor in my home. For years I have been trying to come up with a way to keep my cat litter trash bucket from having offensive odors. This has been however easier said than done. I have used trash cans, bags, bags inside of trash cans, sprinkling the trash cans with baking soda, you name it, I've tried it. 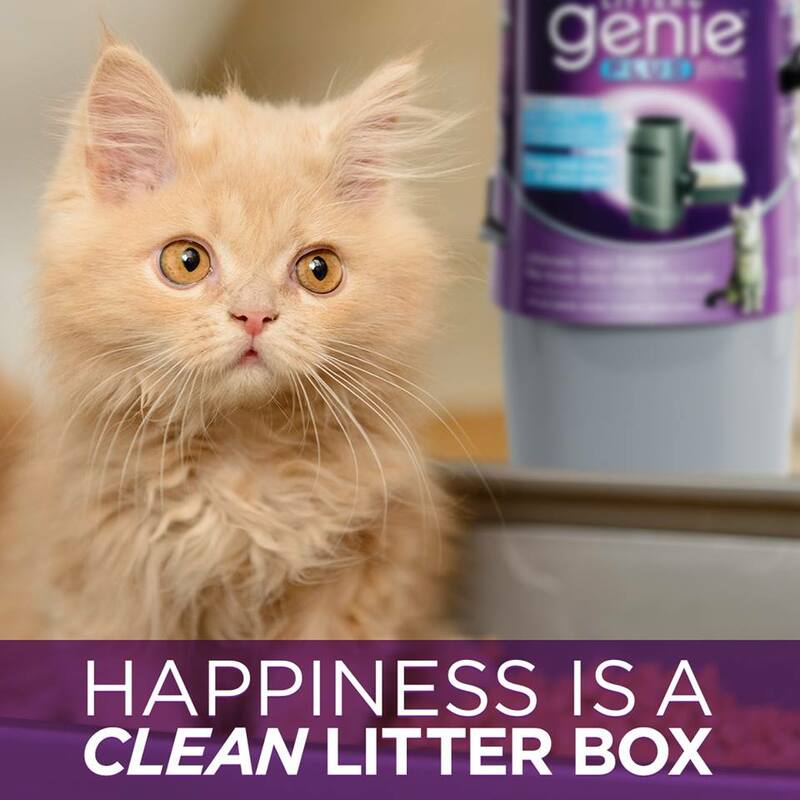 When I heard about the Litter Genie I was thrilled to give it a try. I learned about the concept and it just seemed like a pure genius idea. 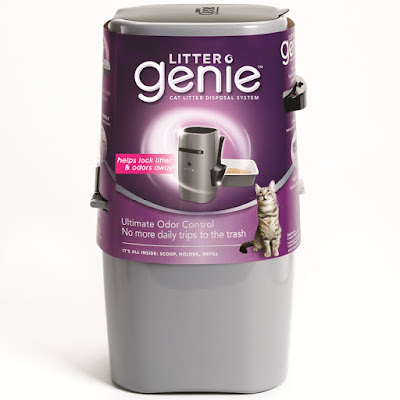 This week the kind folks at Litter Genie sent me a Litter Genie pail to try out in my home with my cats. As soon as it arrived, I was anxious to see how it would work! Setting up the Litter Genie took only minutes. I installed the bag refill pack into the top section of the pail. I followed the instructions and had my bag tied, and ready for use! Fast forward a few hours after my cats had done their business during the day, I was ready to see what the hype was all about. I was able to scoop my litter, and toss it in the pail. Then pulled a lever (I did this twice just to ensure that all waste was gone) and that was it. I opened up the lid after and the waste was out of sight and out of scent! Fast forward again to the next morning when it was time to clean the litter boxes again. I scooped out the waste, lifted the lid and to my surprise, no smell. I repeated the steps as I did the day before, and I was good to go! After 2 days of use, I decided it was time to start a new bag. All I had to do was open the bottom compartment, pull down on the bag, just enough so that I had room to tie off a knot, and cut the bag using the handy cutter which is mounted right in the Litter Genie. Tied a knot in the bag and I was able to take it to my trash can and dump it. Odors were locked in and sealed. After I came back and tied a new knot, the Litter Genie was ready to be used again! The whole process of the Litter Genie is amazing. It has eliminated the litter box trash can scent that I always struggled to conceal. It is by far a wonderful tool that I highly recommend all cat owners try out! The good news is that Litter Genie is available in Petco, Pet Smart, Target, Walmart, Amazon.com, Chewy.com and other retailers where pet products are sold. The Litter Genie retails between $14.99 and $16.99 depending on your location. You can also purchase the refills for $5.99 to $35.99 depending on your needs.